If you’re in a position where your old (we’re talking REALLY old) pool heater finally gives up the ghost, the search begins for a brand-new system that is going to be able to heat up the pool much, much faster – and more efficiently. For those with large pools, getting your hands on a 400,000 BTU (at a minimum) unit that also offers high energy efficiency ratings is necessary. After searching high and low through all kinds of different options, one of the models I was able to test is the Sta-Rite SR400LP Max-E-Therm heater and I couldn’t be happier with my choice! The first thing that I noticed about this particular heater was just how lightweight it was compared to other propane or gas heater models I’ve seen. We’re talking about a pool heater here that is only going to weigh about 135 pounds or so, which might not sound like that lightweight of a heating system at first, but if you’ve ever had an old pool heater – or ever had to remove an old pool heater – you know just how heavy these things can get. I really (REALLY) like the fact that the entire enclosure of this heater is made completely out of a rustproof material, a proprietary blend of composites specifically cooked up by this manufacturer to prevent rust from ever happening. This should extend the life of your pool heater dramatically, especially if it will be exposed to the elements year-round. The only thing that I really wasn’t all that over the moon about with this particular unit was that it is a bit of a headache to install all on your own. There is a “retro fit” kit available through the manufacturer that is supposed to fit with other systems so that you don’t have to run a lot of extra plumbing, but it didn’t work in my particular application. I hired a professional to ensure that it was connected properly. Well worth the cost. Enjoying an 84% efficiency rating that dramatically lowers operating costs across the board, this particular unit enjoys the number one rating in its class for energy efficiency. You will definitely notice the difference “at the pump”, so to speak. You may still purchase the same amount of propane every year, but you will not rip through it like you would with older models, resulting in left over propane at the end of the season. Thanks in large part to the 400,000 BTU heating system (and other rather ingeniously designed “heating tank” that evenly distributes and transfers heat from the inside out), the heating capabilities of this particular unit are absolutely off the charts. If you have a relatively small pool in your backyard, this heater is able to completely heat everything up nicely overnight. That’s a whole lot faster than less efficient systems could have ever hoped to pull off! 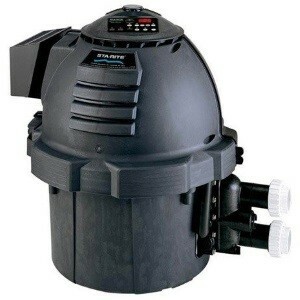 Anytime you’re talking about dropping nearly $2000 (or more) on a pool heater, you need to know that you are spending your money on exactly the right solution. Not exactly the least expensive option on the planet today, I can still say with absolutely zero reservations whatsoever that I would purchase this pool heater again and again – if I had to – and can happily recommend it to anyone and everyone out there. Yes, it might be a bit of overkill depending on the size of your pool (especially since it is designed to heat large pools with zero difficulty whatsoever), but just knowing that it’s going to do exactly what I need it to almost instantly is worth every penny. My current Rheem heater has been refitted twice and is again malfunctioning. The culprit is the water which I treat religiously with acid and softener, but eventually the heater clogs up. Is there a heater on the market that is resistant to hard water?